I had my 34 week check up yesterday and everything is normal as can be according to the doctor. My weight gain is normal, my blood pressure is where it should be, and my belly is measuring right on target. 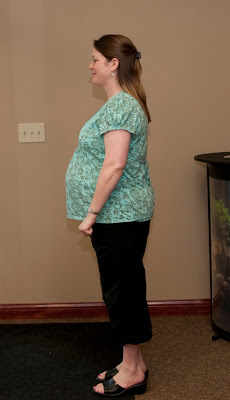 Speaking of belly.... many of you have been asking for me to post a prego pic. One of the girls at work likes to take belly shots of all the pregos in the office. She takes them once a month in the beginning, then twice a week, and she'll then take one every week during the last month. She only sent me this current week's though (week 34). So here it is! I'm starting to think maybe I should have bought more maternity clothes. The shirt in this photo is just a loose fitting shirt that I was hoping to be still to wear after the baby's born. I don't how long it will be covering the tummy though! The girls at work had a baby shower for me this past weekend and I will post some photos later this week. They went all out, especially with food! It was super thoughtful. Thank you for posting this! You look so cute.